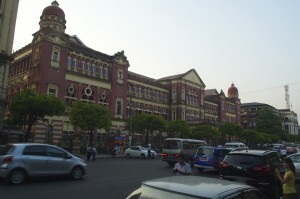 The short flight from Bangkok brought us to Yangon. The visa on arrival procedure was very simple, quick and efficient. I couldn’t help think that some other, much more developed countries could learn a few lessons. I guess I have to take into account the fact that Myanmar does not yet have crowds of visitors entering the country all at the same time. The day will come. The drive from the airport to our hotel was a bit of an eye opener. Myanmar had been cut off from the rest of the world, had suffered economic sanctions for years. I was expecting to see a city that was struggling with its infrastructure, was dirty and disorganised. Not at all. The roads were good, if a little choked up with the morning rush hour. The streets were clean and, as we neared the centre, there was plenty of evidence of burgeoning development. Understanding the economic benefits of tourism, the government is encouraging the building of new hotels. 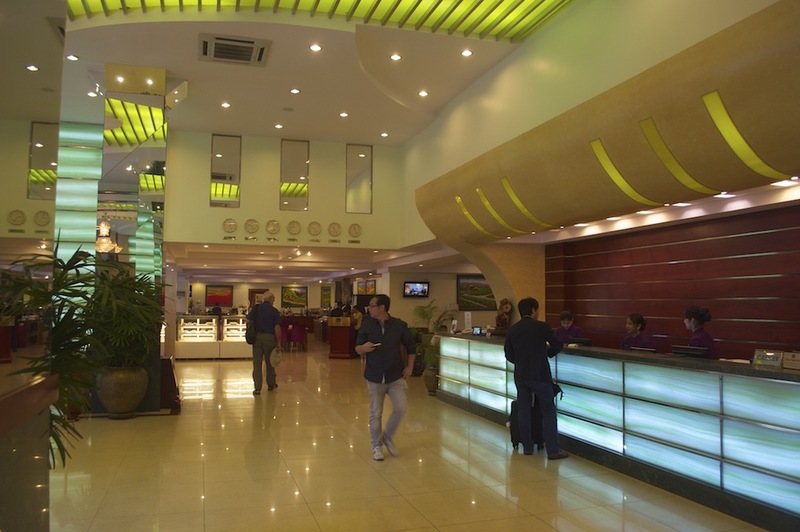 Our own hotel, Green Hill Hotel, is a very modern, high specification hotel and to give it credibility with the world market is part of the Best Western group. As it was early morning our rooms were not yet ready, nor those of the bulk of the group who arrived an hour or so before us from the UK. They had been taken by our group guide to the Royal Lake, Kandawgyi, and parkland for a leg stretch after their long journey and while they waited for their rooms to become available. Angela and I joined them in the park. Across the water we had beautiful views of Shwedagon Pagoda and despite the distance it was still reflected in the green water. The lake was a little too green and the only fish we saw were floating belly up and were very dead. 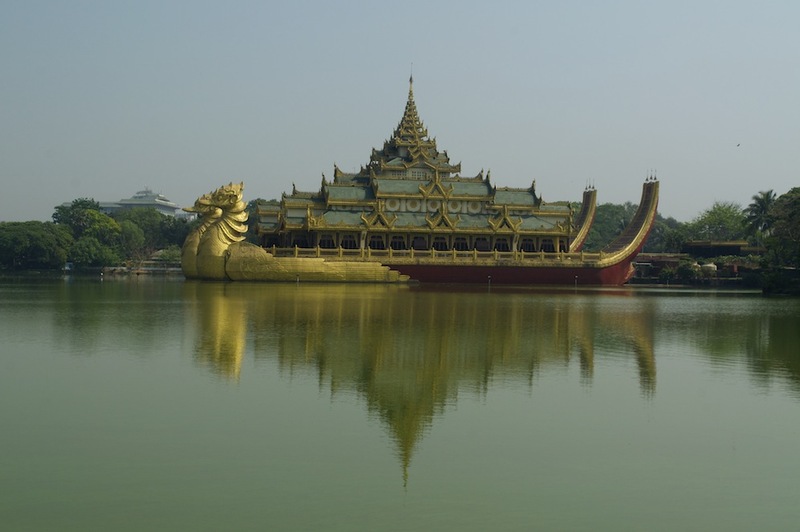 Also across the water was a huge golden dragon boat, a traditional royal barge, now used as a restaurant. It is spectacularly big. Returning to the hotel at 10.00 we relaxed in the restaurant with coffee while we waited for our rooms to be ready. The air conditioning was much appreciated in the comfortable surroundings. 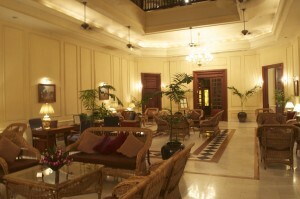 As the rooms became ready people disappeared to relax, freshen up and enjoy. The rooms are large and well furnished. The King-size beds look very welcoming. Each room holder was given a password to access the internet, which, although fairly slow was a welcome surprise. The minibar was fully supplied, the first time we had encountered this in seven weeks of travelling. The rooms were significantly better than I had anticipated. The outlook from the rooms was over the canopy of trees that surround the hotel. Another facility that was not expected was an ATM by the entrance. While there are not yet that many in Yangon, it won’t be long before they are more accessible. As this was everybody’s first day and they were sleep deprived we did not have too much on the agenda. After a typical Myanmar meal in a restaurant we had free time to enjoy the air conditioning during the hottest part of the day before venturing out again at 4.30. The group, having rested, met up at 4.30pm and we visited the old colonial part of Yangon, that was developed by the British in the 1860s. I have to be honest here and say that I did not realise how much influence Britain had had in Burma. The hub of the town is made up of colonial buildings, one after another. Many are in need of renovation and look sad with the blackened stains of humidity, but those that have been renovated look really good. Renovation largely depends upon foreign investment rather than relying on the limited funds of the Myanmar government who have the far more important issues of health and education to deal with. One building that has withstood the test of time is the Strand Hotel, a fine example of 1860s colonial architecture. We ventured inside and explored the various ground floor public rooms. It was like stepping back in time. Even smoking was allowed in the bar, and it was strange to see people taking advantage of the opportunity when we have already become so used to not seeing it in the UK. Tasty street food. Hens’ feet can be seen in the pot top left. As the light faded and the working day came to an end the streets became a seething mass of activity. 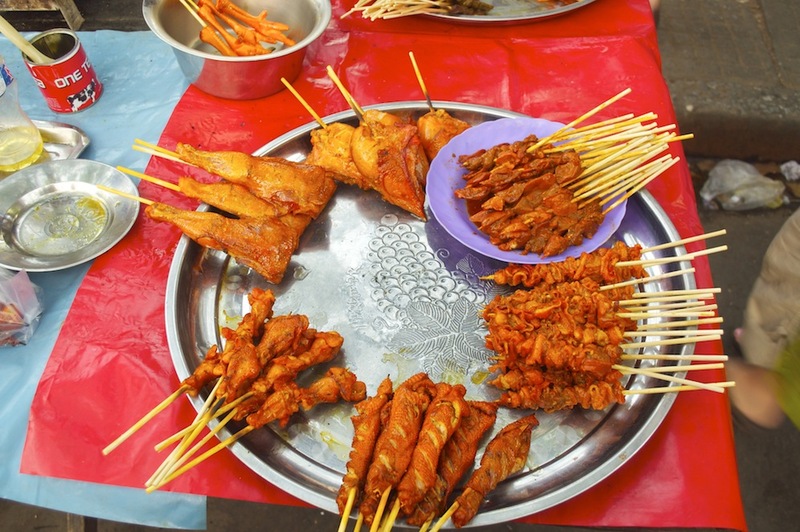 Small stalls selling tasty snacks of pork and chicken were cooking on small stoves while people sat at small tables on plastic stools eating and socialising. The most unpalatable item were hens’ feet on the barbecue! Other stalls selling a wide range of tacky objects sprang up but there were a surprising number of second hand book stalls in amongst them. Traffic became busier and buses, taking people home were vying for custom. As the sun set the lights were turned on the pagodas and their golden glow was like beacons in the night sky. All too soon it was time for dinner and we were taken to yet another superb restaurant. I had expected this trip to be very frugal with mainly vegetarian food and a lot of rice. There was rice for every meal but there was also plenty of meat, chicken, beef and pork and we could see no reason why we should not eat it. Our first day in Myanmar had been long and full so an early night was needed so we would be ready to face what the next day would bring. Breakfast the following morning was a feast of such variety, healthy and less healthy options available. Our first cultural visit of the day was to the Reclining Buddha, at 72m long, one of the largest images in Myanmar. I had expected, for some reason, for it to be out in the open but it is housed in what can best be described as an open sided shed. Common sense should have told me that it had to have some protection from the elements. It is huge and looks quite serene, and feminine. What makes the Reclining Buddha different from all other Buddhas, other than the fact that it is reclining, are the glass eyes, which make it more lifelike. 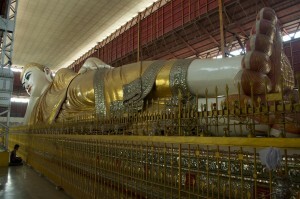 The original reclining Buddha, built in 1907, was in a half sitting, half lying position and was quite ugly. It was replaced, in 1957, by this much more attractive version. 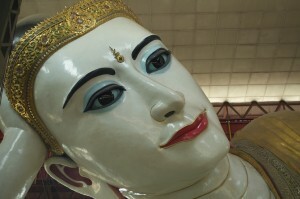 Lying on its left side, head propped by a hand, Buddha looks content in this resting pose. The glass eyes make its face more realistic. The robes are covered in gold leaf, and despite the fact that it is under cover, there were signs of damage to the leaf. In April of each year the gold leaf is replaced and other maintenance work done, using money collected through donation throughout the year. The souls of the feet are pink and covered in symbols depicting the different aspects of Buddha’s life. Fortunately an explanatory chart was nearby making it a lot easier to understand. The Chauk Htat Gyi Pagoda where Reclining Buddha is housed is also a monastery and we were able to go into it to see how they lived and to understand what their daily routine was. 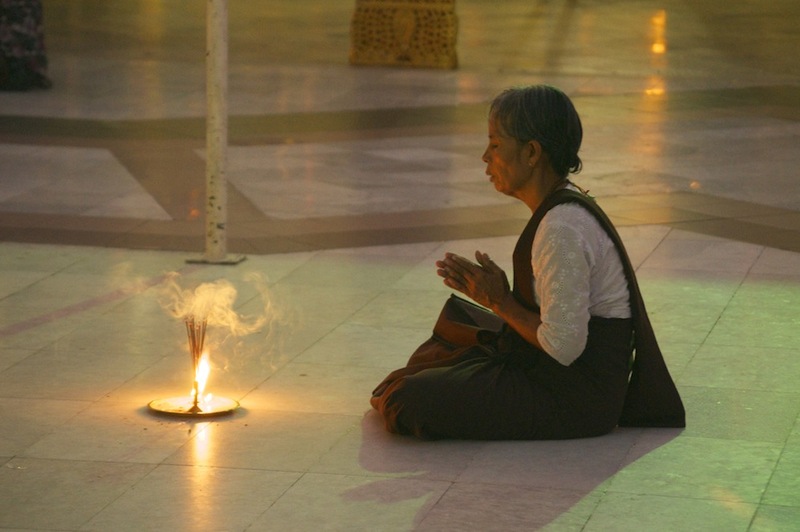 Each morning the monks are woken at 4.00am by a wooden gong. Of the many noises which roused us gently from our sleep in the early hours, this was one close to the hotel. They breakfast and then prepare to go out into the streets to acquire alms in the form of food from the community. 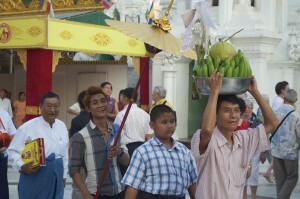 They carry an alms bowl into which people donate rice and vegetables. When their bowl is full they return to the monastery where all the collections are put together and a lunch is prepared to be eaten between eleven and twelve and that will be their last meal of the day. For the rest of the day they will study until retiring early for bed. Most of the monks were still out collecting their alms so there were few in the monastery while we were there. I was surprised to see one monk smoking, clearly a cigarette he had been given rather than him buying. In the dormitory we saw the frugal space they have with a roll mat to sleep on. They have no personal possessions; even their red habits are not their own. One monk who had already returned from his walk around the neighbourhood demonstrated how he robed up before going out. It was a complicated procedure of twists and folds and nothing more to hold it all together. He, like all the other monks we met were only too happy to chat and give us an insight into their lives. Before lunch we visited Scott Market, a tightly packed grid if small stalls selling just about anything. This was not a food market, although there were a few food related stalls, but a market devoted to clothes, household goods, souvenirs and much more. All the stall holders were friendly and, while they sometimes sought our patronage, they were not at all demanding. They were extremely easy to approach and enter into conversation with. I was amazed how good their English was. Nearly all the men, young and old, wear a longhi , a sarong like garment pulled around the waist and tucked in. I bought one while Angela bought herself a cool to wear blouse, much needed in temperatures nudging 40 degrees in the hottest part of the day. The hottest part of the day is the first few hours of the afternoon so after lunch we returned to the hotel for an air conditioned rest. This was to be the pattern each day. 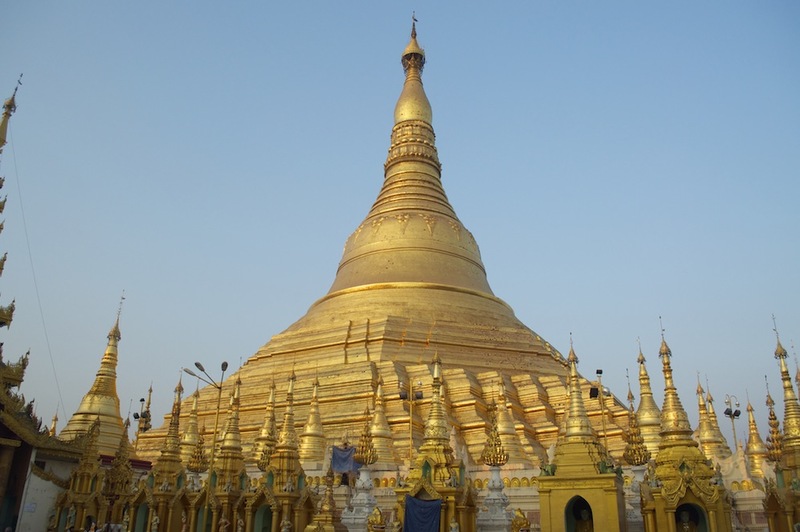 As the afternoon progressed and the temperatures began to ease, a little, we went to the magnificent Shwedagon Pagoda, set on a small hill not far from the hotel. 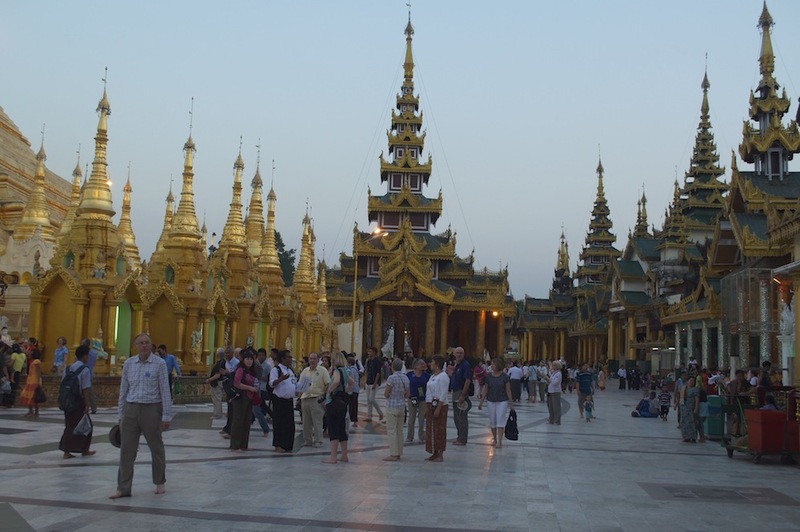 This pagoda is on a par with some of the great heritage sights of the world. 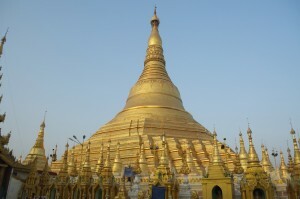 The central feature is the pagoda, a huge golden dome with a spire rising from its centre. It is entirely covered in gold leaf and they maintain there is about 10 tonnes of gold covering it. They replace and repair the leaf each April, a process that takes approximately four months when fewer tourists and pilgrims visit. Around its base are much smaller pagodas, similarly adorned. A paved walkway goes all the way around, on the outside of which are a great many temples where devotees prey and offer money to the various deities. It is not the easiest place to photograph as everything is very close. Sometimes you need to step back but it is impossible to step back far enough to get everything in the frame. It really is most amazing place and you can spend much more time than we were allowing and still not see it all. Throughout our time there the light was constantly changing as the sun sank lower in the sky casting its dying rays on to the gold leaf, adding even further richness to the colour. As the sun disappeared artificial lights took over the mantle of lighting up the pagoda and all that surrounds it. More people were now strolling around, sitting admiringly and praying. There was a fabulous atmosphere. During our time there a procession came through. In the front was a man carrying a bowl of fruit. Behind him came a young boy of about twelve. The man behind held a tall umbrella over the boy’s head. Finally came assorted family members, parents, grandparents, aunts and uncles. Everybody was smiling and laughing apart from the boy who had a very anxious expression on his face. This was his last night as a normal twelve year old. In the morning he was going to the monastery to become a monk. Our time in Yangon was coming to an end. The Garden City had been a real eye opener and lots of impressions have been shattered. The people are delightful, hard working, happy and seem genuinely pleased to see us. They are a patient people and show no aggression towards others. This was particularly apparent on the roads. There is a lot of traffic in the city and there are times of day when you cannot go far fast. There seems to be total acceptance of this fact. Despite the traffic and congestion it is quiet, apart from the bus conductors shouting out their route to potential passengers. Something is missing though. There are no horns. It is illegal to sound a car horn; caught doing so can lead to the equivalent of a $10 fine. So the streets are quiet. There is something else missing. There are no motor bikes. The government has banned motor cycles from the city’s streets to ensure they do not become more congested. It is an interesting city and I feel sure we have only scratched the surface and there is much more to see. Maybe we can explore further when we return towards the end of this trip. 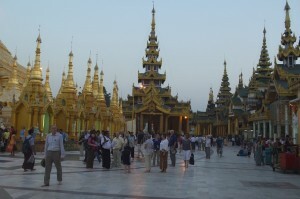 This entry was posted in Myanmar by jwalton. Bookmark the permalink.